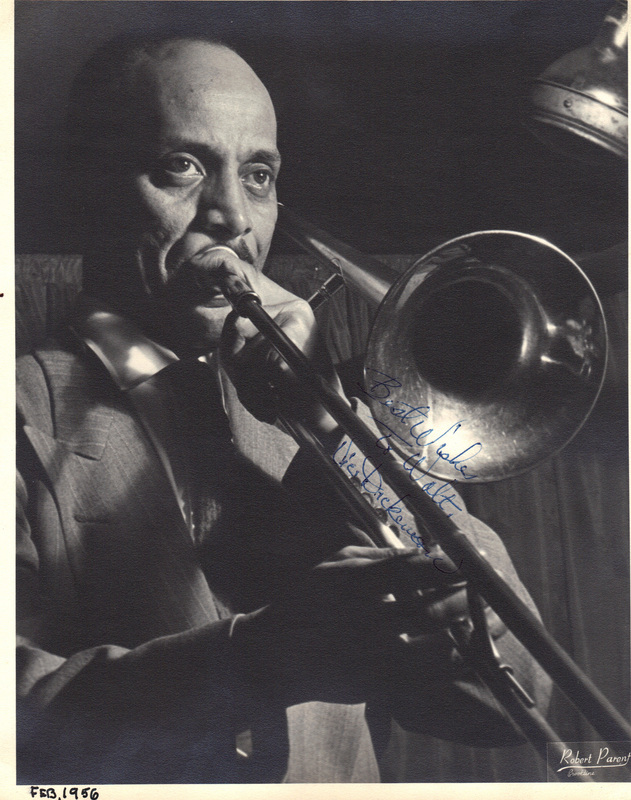 Vic Dickenson, trombonist, singer, composer. Photograph by Robert Parent (circa 1951). Inscribed to drummer Walt Gifford. 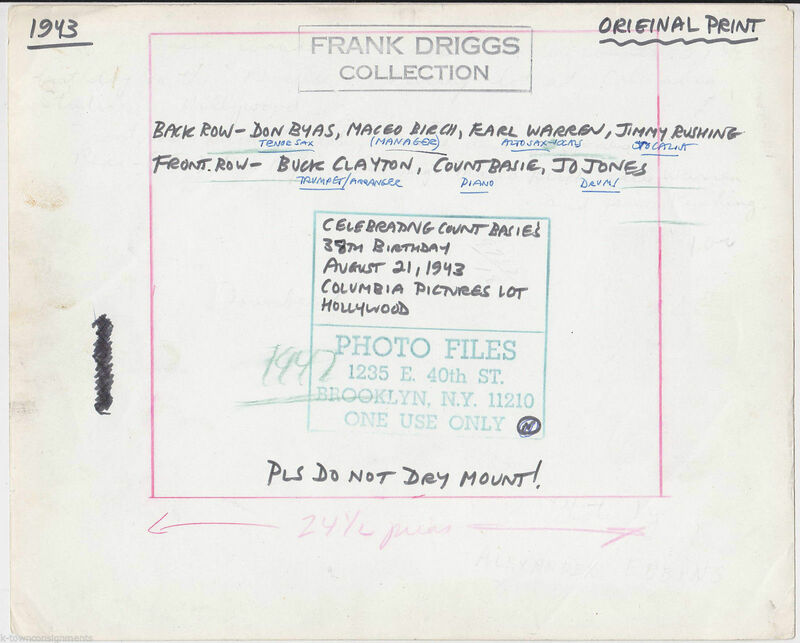 From Gifford’s scrapbook, courtesy of Duncan Schiedt. I dream of a jazz-world where everyone gets the credit they deserve, where Vic is as celebrated — and as listened to — as his contemporaries and friends Roy Eldridge, Lester Young, Benny Carter, Bobby Hackett, Teddy Wilson, Buck Clayton, Sidney Bechet, Mary Lou Williams, Frank Newton, and many more. I’d like writers to pay attention to his delicate lyricism, his melodic improvisations, his way of illuminating a song from within. This would require new language and new hearing: no longer putting Vic into the familiar compartments of “sly,” “witty,” “naughty,” and so on. It would also require some writers and listeners to put aside their barely-concealed disdain for jazz as it was played before Charlie Parker came to town. No disrespect to Bird, mind you, who jammed happily with Vic and Doc Cheatham and knew that they were masters. 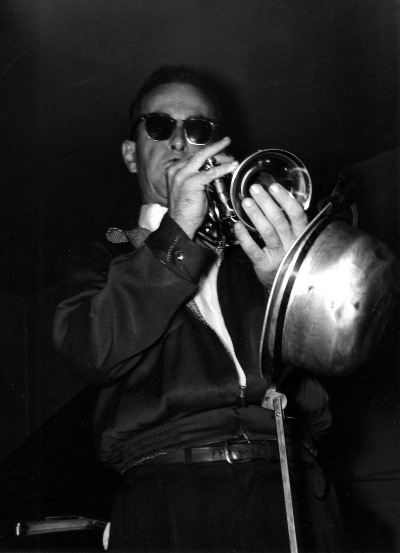 But Vic was more than a “Dixieland” trombonist, more than someone chained to TIN ROOF BLUES and SLOW BOAT TO CHINA. It is indeed true that having Shad Collins, Ed Hall, Sir Charles Thompson, Steve Jordan, Walter Page, and Jo Jones along — in gorgeous sound — did no one any harm. But I ask my listeners to do the difficult task of putting Vic first: his sonority, open and muted. His time, his phrasing, the vocal quality of his sounds (plural). His love for the melody and for the melodies that the original suggested. His delicate concise force: what he could say in four quarter notes, or eight bars. There was and is no one like him. I would never disagree with this. I don’t wish to set up any competition, but I think everyone should give thanks to Count Basie — and not just once. And not just musicians, either. It is fashionable, still, to affect hipness, and that is not limited to people under 30. And some intriguing theoretician has suggested that the qualities we praise as hip — subtlety, originality, a wry way of perceiving the world — were exemplified by Lester Young before Kerouac and the Beats took them as their own. I like this theory, although what Pres would have made of a Williamsburg or Berkeley or Portland hipster is not known. But I would propose Basie as the original Parent of many virtues we prize. Singularity, although a loving reverence for one’s ancestors (as in Basie’s affectionate nods to Fats Waller), an awareness that joy and sorrow are not only wedded but interdependent (that the blues are at the heart of everything), and a deep emotional commitment to swinging one’s way through life. 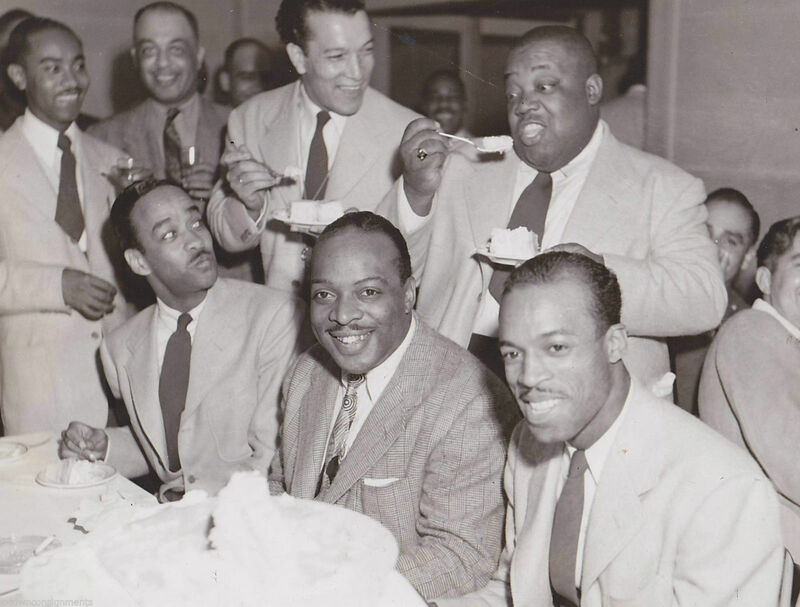 Swinging, as embodied by Basie, his peers and their descendants, meant the maximum of grace with the minimum of visible labor. The style later exemplified by Astaire with a Kansas City world-view. Passion and fun, no less powerful for being streamlined to their essentials. His playing and his approach have been characterized and parodied as “minimalist,” but I think of it more as a Thoreau-inspired simplicity. Don’t need that note, do we? Let it be implied. Unheard melodies and all that. 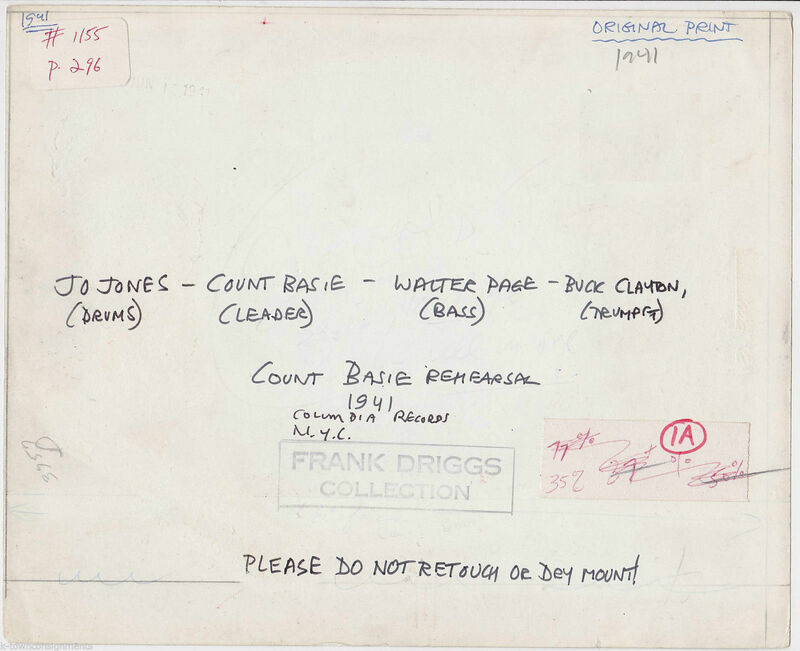 How Basie knew what he knew is beyond us, but the evidence is there for us to hear. 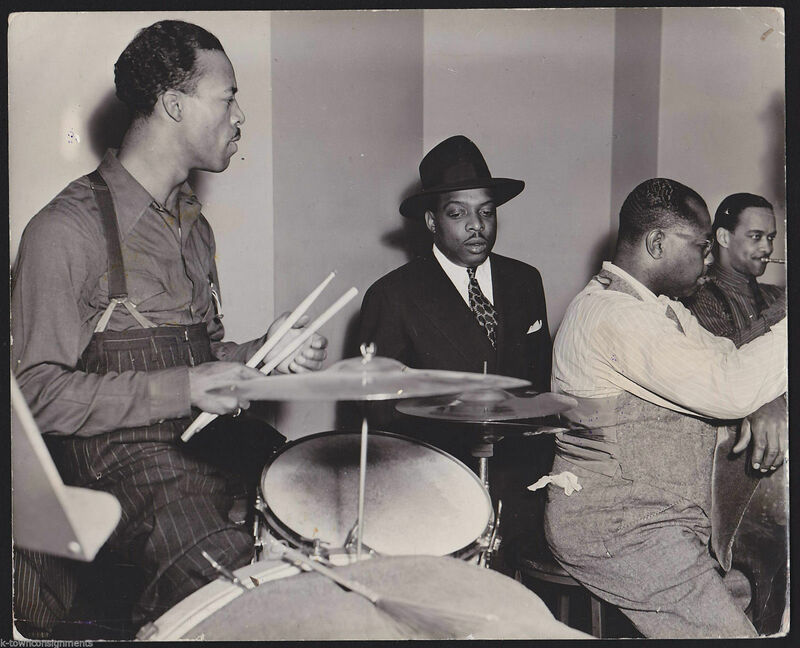 That’s the 1939 Chicago session, issued in the Seventies as “Basie’s Bad Boys”: Buck Clayton, Shad Collins, trumpets; Dan Minor, trombone (audibly? 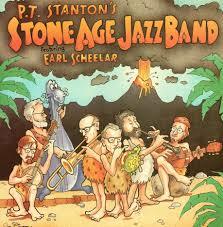 ), Lester Young, tenor saxophone; Basie, piano; Freddie Green, guitar; Walter Page; string bass; Jo Jones, drums. Yes, the studio sound is foggy and dense, but the music just flies and smiles and rocks. What I notice first, always (this is a photograph often reproduced but also often cropped) is Basie’s dreamily unfocused expression which might be deep concentration. Jo’s nearly angry attentiveness, his thinness (that protruding Adam’s apple), his full head of hair and tidy mustache. Walter Page’s substantial girth. The handkerchief not quite tucked away in his back pocket. The way his vest is strained by what’s in it. The height of Jo’s beautiful trousers, and his suspenders. The way Page (casually?) is listening to what handsome Buck Clayton is playing. How beautifully everyone is dressed, in an era before jeans, t-shirts, hoodies, and knapsacks. Cool, swinging, affirmative. We could follow him, a Sage, for life-lessons.